A martingale collar is the best choice for the dogs that have neck circumference larger than their head, such as greyhounds, whippets; all sighthounds as a matter a fact. Martingale collar is a good tool to prevent the dog slipping out of his collar so lots of people find them useful for their puppies and other young or older dogs that are being taught how to walk on a leash. We can say that martingale collars are best known for their non slip property. A martingale collar fits loosely on a dog’s neck and tightens when needed. Unlike buckle collar that tightens at a given length when closed, a martingale design has additional loop that enables you to tighten the collar a bit uncomfortably when the correction is needed. When the dog encounters other dogs or other distractions that cause him to pull or back out of the collar then all you need to do is pull the leash. The pull will tighten the martingale loop. We feel inspired to do custom made designs. It is possible to make a personalized martingale collar with your dog’s name engraved to a brass plate. 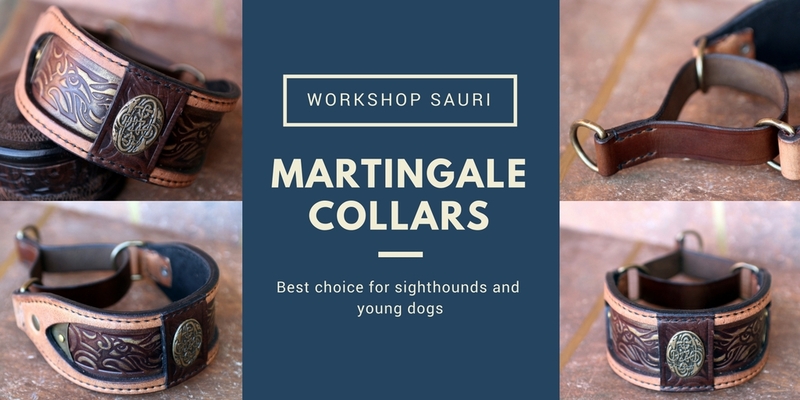 Sauri dog collars go for a bit antiqued look. 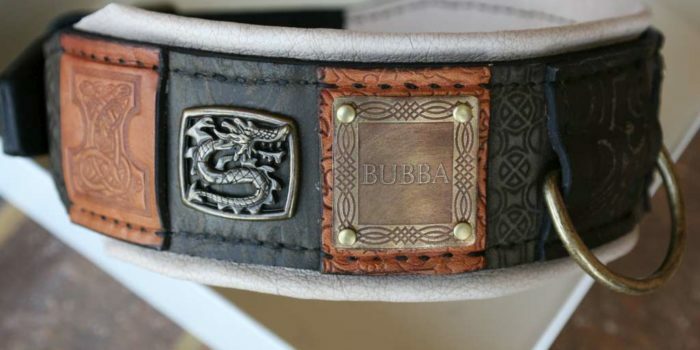 We are able to modify almost any buckle collar design into a martingale collar. Depending on the collar size and style we can add a telephone number too. We can also engrave emblems or symbols that have special meaning to you. Why are we using leather for a martingale loop? Because leather leaves no stains like metal chains, feels more natural around the neck therefore is more comfortable for the dog and because generally speaking leather looks better than chain. If you want a martingale collar made for your dog contact us. We need you to measure your dog as described below. Let us know which design would you like us to modify into a martingale collar. 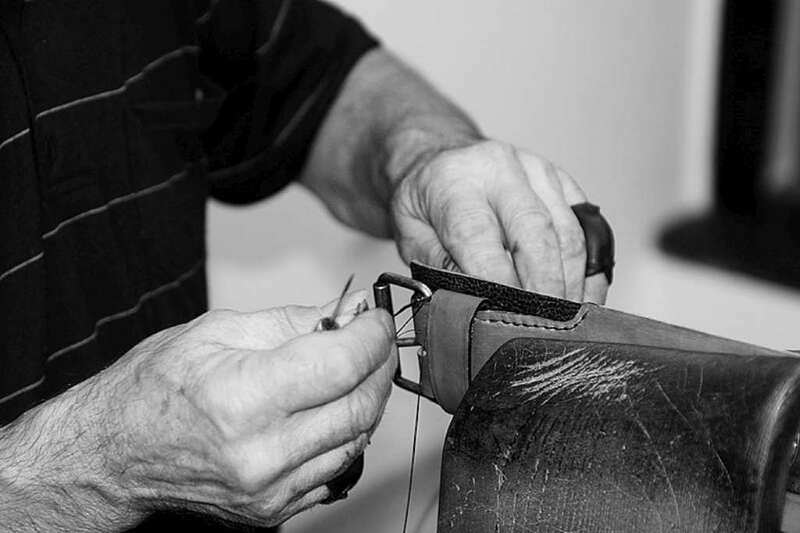 For martingale collar it is essential to take a measure correctly. You need to measure the largest part of your dog’s head (around the head, in front of the ears), in the middle of the neck and at the base of the neck.